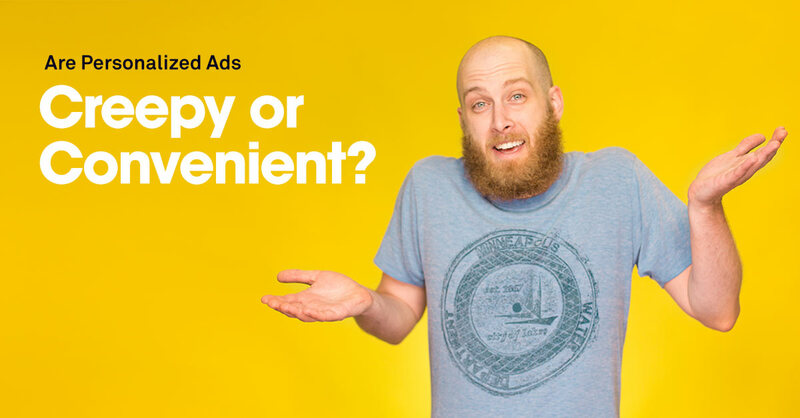 New Survey Data: Are Retargeting Ads Creepy or Convenient? Everybody without an industrial-strength ad blocker is followed around the internet by retargeting ads of one kind or another these days. But the execution of those ads varies widely. Some are pretty in-your-face about the fact that some piece of code has been tracking you, while others are much subtler. They might even seem like a total coincidence—if you notice them at all. With the development of Center’s new Facebook custom audience integration, recently the Leadpages marketing team got curious: how much attention does the average consumer pay to retargeting ads? Are they creeped out by ads that clearly refer to something they’ve done or searched for? Glad to have an easy way to find their way back to a destination they’ve intended to revisit? Confused about how the ad knows so much about them? b) Annoyed, but I’d click if the deal were good. c) Annoyed—I wouldn’t click no matter what. d) I wouldn’t think much about it either way. Over 41% of respondents claim that they’d never click on an ad based on their data or activity—no matter how good the deal advertised. That’s a remarkable chunk of the population. Still, it’s less than the majority: everyone else can potentially be induced to click, including the 28.5% of respondents who aren’t phased by retargeting ads. For these people, even distinctly personalized ads are just part of the internet landscape, totally unremarkable. After seeing these results, we wondered: could these results have been influenced by the emphasis the question placed on the logistics of remarketing? How many of the respondents who said they were firmly against retargeting ads might actually be receptive to them … if those ads were less explicit about how viewers were being tracked? In this version, the hypothetical ad is clearly well targeted—it reflects the viewer’s interests—but no stress is placed on how that targeting came about. When the question is framed like this, fully a third of respondents find retargeting ads unremarkable (though 27.9% still say they’d never click). And many more respondents see the upside of retargeting: who could argue with a good deal that reflects your interests? But not every group of respondents was equally swayed by this linguistic sleight of hand. In fact, 25- to 34-year-olds were the least likely to be dead set against interest-based retargeting ads—18.8%, compared to 38.4% for the next age bracket up. Every other age group fell somewhere in the middle, with no clear age-based pattern outside these two extremes. What’s it mean for your marketing? It’s hard to say, except that your retargeting ads might have an especially easy time reaching younger adults and an especially difficult one reaching just slightly older ones. Sure, we look and act like typical human beings for the most part, slipping undetected among people who have no idea what “tracking pixel” and “PPC” mean. But when it comes to judging how our audience will react to our marketing, we’re usually not a useful standin for the people we’re trying to reach. We see some company pushing a little too hard online and we think—well, that was made by a person with numbers to hit and bills to pay this month. Or we see a super-personalized, borderline-creepy retargeting ad and wonder: ooh, how exactly did they do that? Apparently, very few of us think we’re totally immune to retargeting ads, although we don’t exactly relish seeing them. We notice what goes on behind the curtain, and we’re largely willing to give each ad a fair shake. This might be the biggest way in which our own marketing team is different from our respondents. Interestingly enough, the percentage of people we might call the “self-interested deciders”—the ones who’d decide to click based on the merits of the specific deal, not their feelings about the ad technique—stayed almost the same across both official survey versions. Any way you look at it, they’re a decided minority among consumers. Which means everyone else is only sort of seeing your retargeting ad when you serve them a retargeting ad. Their impression is strongly colored by their overall awareness of tracking techniques and their feelings about privacy and advertising in general. If you’re targeting a general population of consumers, you probably have the most room to grow by aiming for those people who’d be strongly annoyed if they knew they were being targeted based on their personal data and web activity—but who soften their stance when your ad seems more powered by serendipity than by a tracking script. So be subtle, and let your knowledge of what prospects have done play out behind the scenes. That is, use that knowledge to craft the ideal offer and ad copy for your audience. Use it to build a landing page for that offer that perfectly reflects visitors’ familiarity with your business. Just don’t creep them out. For more tips on doing exactly that, check out this blog post: “4 Rules for Writing Effective Retargeting Ads.” And stay tuned for more data-based peeks into the brains of everyday consumers. We love running surveys like this, and you can expect to see plenty more to come. Got anything you’d like to ask average internet users? Leave a suggestion in the comments and we’ll consider it for an upcoming survey!